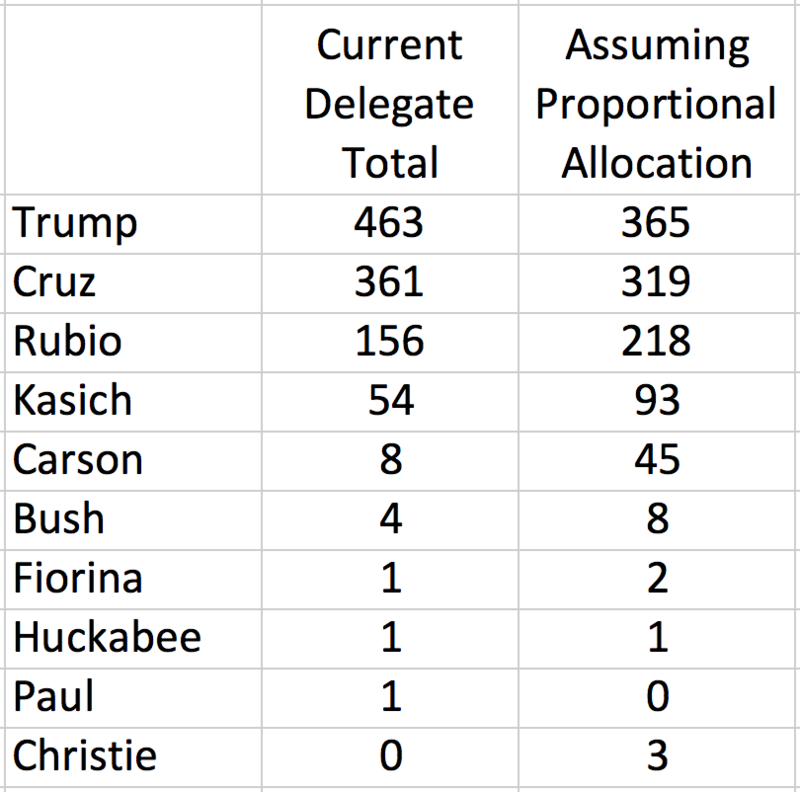 What if the GOP Allocated Used Proportional Allocation of Delegates? In the Republican presidential primary system, different states apportion their delegates among the candidates in a variety of ways. In the upcoming contests in Florida and Ohio, all of the state’s delegates are pledged to the candidate who receives the most votes state-wide. In Nevada, delegates are allocated proportional to the vote total (you get one of the 30 delegates for each 3.33% of the vote you get). But a lot of the states are much more complicated. In South Carolina, three delegates are assigned to the leading vote-getter in each of the seven congressional districts, and the remaining 29 go to the winner statewide. Trump won all 50 this year by leading the pack in each congressional district. A number of the states impose a minimum threshold. For example, Massachusetts and Kentucky do proportional allocation of their 42 and 46 delegates, respectively, among all candidates receiving at least 5% of the state-wide vote. Several states add a winner-take-all threshold. 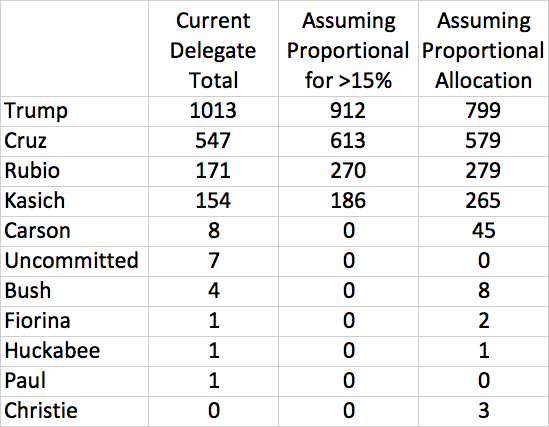 Vermont does proportional allocation of its delegates among candidates who receive at least 20% of the state-wide vote. 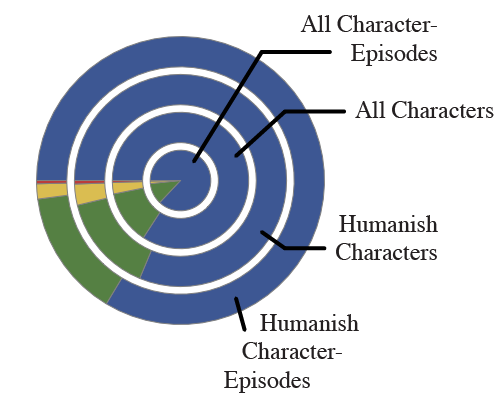 But if any candidate gets more than 50%, they receive all 16. In general, the effect of these rules is to push delegates towards the winning candidates — and drive inviable candidates out of the race. This happens gently at first, as many of the early contests are more proportional. Then, as the season progresses, things take on more of a winner-take-all flavor. 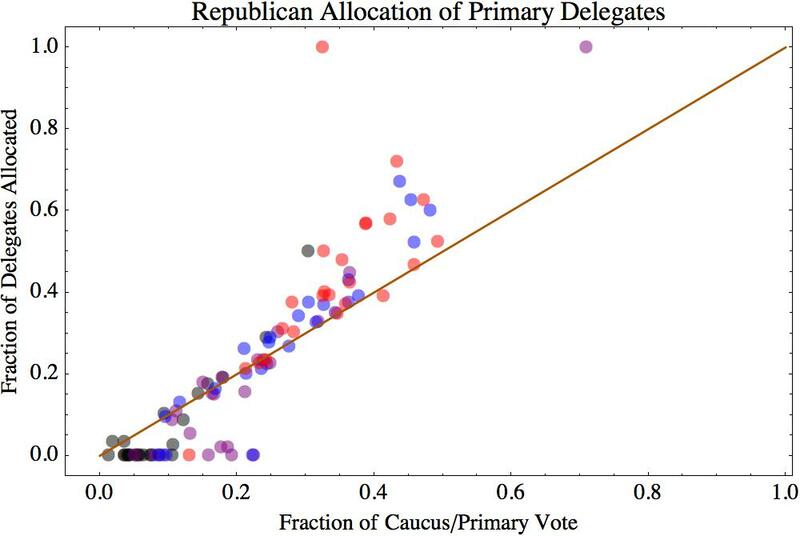 The brownish-orangish line is what you expect from strictly proportional allocation of delegates, and the points plotted indicate allocations from individual state-wide (and Puerto Rico-wide) contests. Red is Trump, Blue is Cruz, Purple is Rubio, and Black is Kasich. One thing you can see from the plot is that Trump seems to be the greatest beneficiary of the current allocation system. This makes sense, of course, since he’s the frontrunner, and the system is basically designed to drive a consensus around the frontrunner. And, if the frontrunner were anyone other than Donald Trump, the Republican leadership would probably be very pleased with how it was working. That’s not to say that things would have worked out this way under that allocation scheme, since a different scheme would have led to different reporting, different campaign strategies, and so on. But, it’s a nice simple way to quantify the effect of structural properties of the primary system on the outcome. In that spirit, what this tells us is that about a fifth of Trump’s delegate total — and about half his lead over Cruz — can be chalked up to Republican delegate allocation math. We could ask the same question for the Democrats, but it is not nearly as interesting. 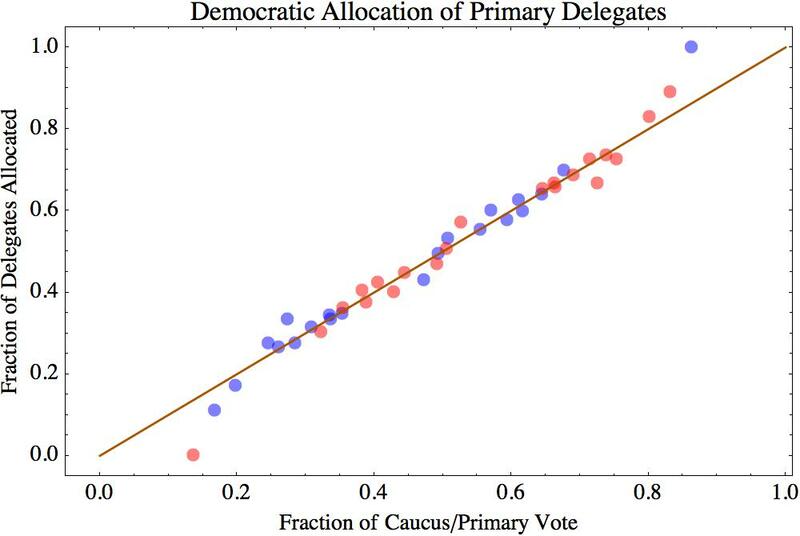 All of the Democratic contests follow the same formula: proportional allocation of delegates among candidates exceeding 15% of the vote. About a third of the delegates come from applying this formula to the state-wide vote, and about two thirds from applying it individually to each congressional district. That system also punishes low-performing candidates, but it does not reward high-performing ones in the same way. 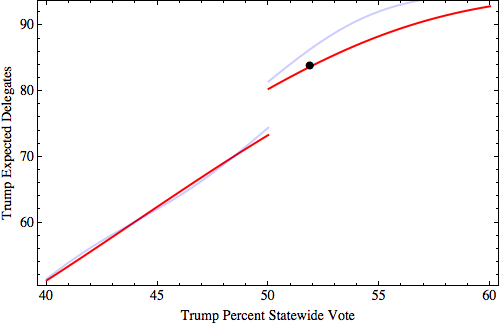 There are no winner-take-all states or triggers (unless you win more than 85% of the vote, guaranteeing that no one else reaches 15%). 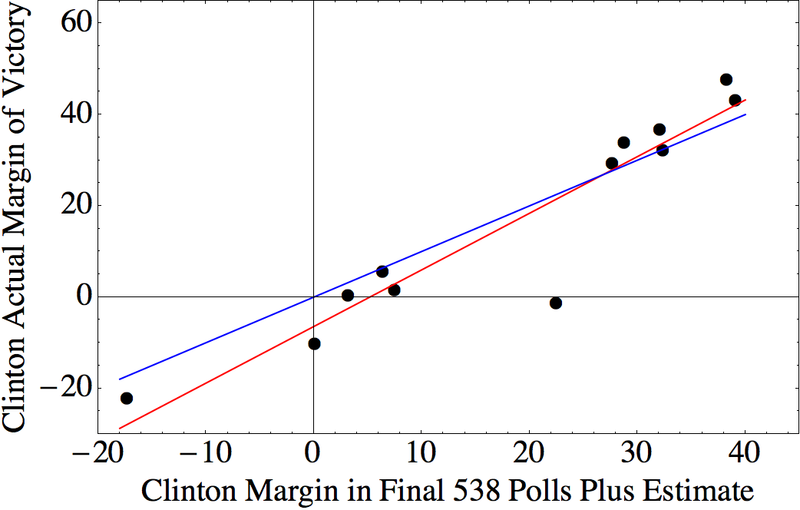 So, the Democratic system leans a bit more towards proportional overall. But much more important is the fact that there are only two competitive candidates, both of whom are rarely in danger of failing to meet that 15% threshold. 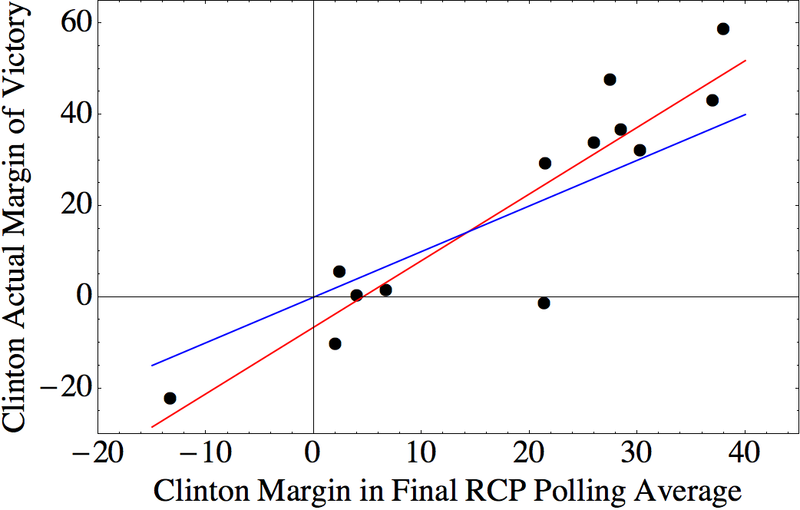 Red points represent Clinton, and Blue represent Sanders. 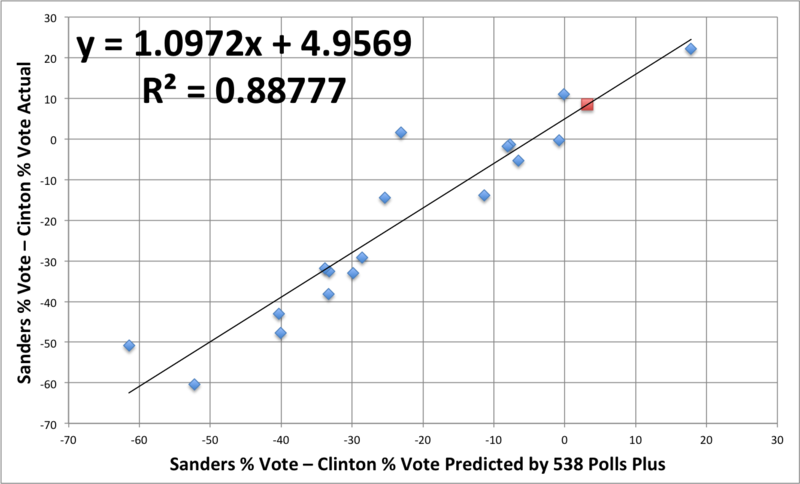 The only real outliers are Vermont, where Sanders got 86% of the vote, and Mississippi, where Clinton topped 85% in two of the state’s four congressional districts. I’m not advocating for any particular delegate allocation scheme here. We know there’s no perfect voting system. I just hope to contribute in my own small way to the enormous pile of regrets plaguing Republican party leaders as Trump sits atop his throne of skulls forcing them to fight to the death. In the wake of Supreme Court Justice Antonin Scalia’s death, Republicans have been climbing all over each other like a less well intentioned pile of zombies in an effort to most loudly claim that President Obama has no right to appoint his successor. Most of the arguments have focused on the fact that we have now entered the final year of Obama’s presidency. 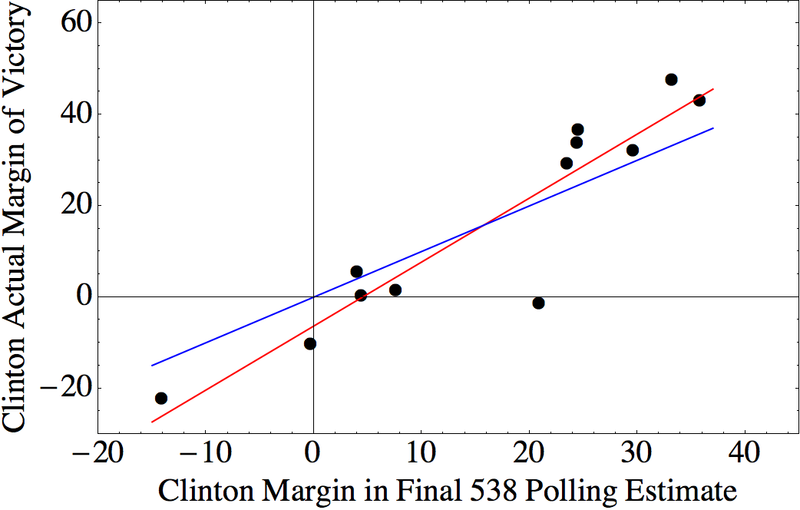 As you will recall, back in 2012, the ballots for president clearly stated that the results would only be construed as representing the will of the people for the next three years. Obviously, these arguments fail any non-disingenuous reading of the constitutional and historical evidence (and contradict arguments previously made by many of those same Republicans), but, you know, the constitution, like the bible, is sacred, infallible, and beyond scrutiny — except when it turns out to be politically inconvenient. Well, the current constitution actually doesn’t address that particular situation, but the fact of the matter is the Supreme Court, obviously, is a very important part of our governmental system. And, when our constitution was put in place, the average age of death was under 50, and therefore the whole concept of lifetime appointments for Supreme Court judges, and federal judges was not considered to be a big deal. 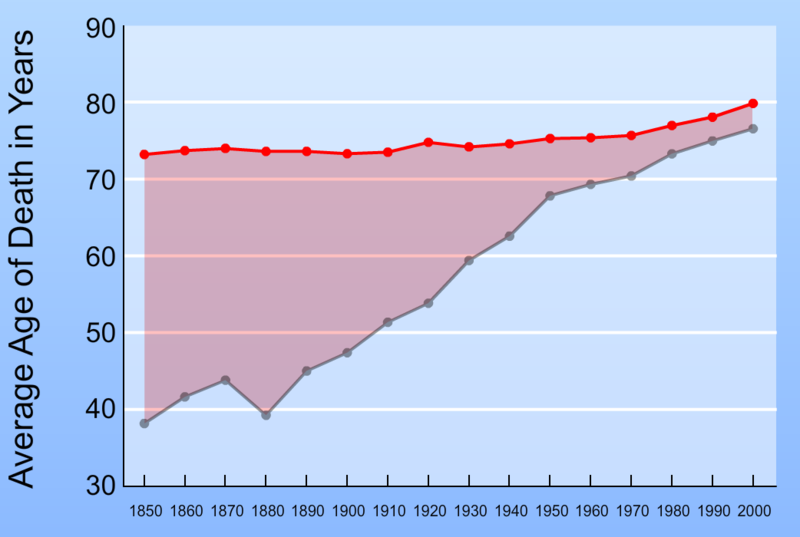 The gray line is life expectancy at birth from 1850 to 2000. 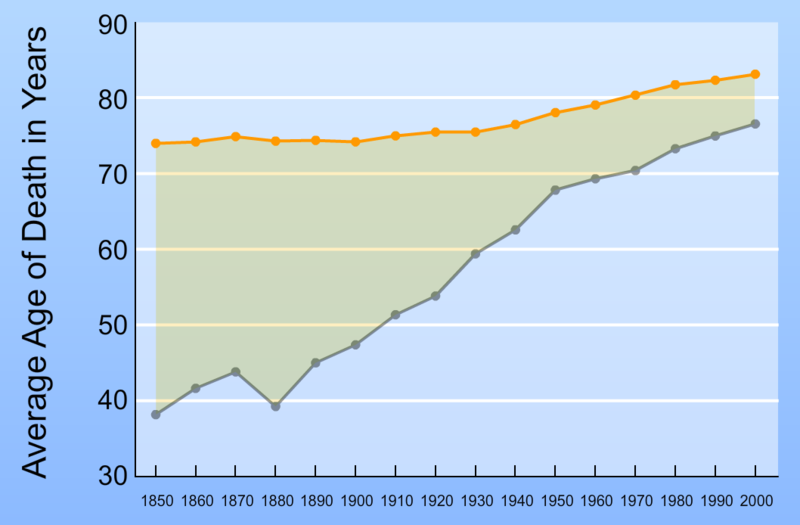 The orange and red lines are life expectancy from age 60 for women and men, respectively. Since people are not typically appointed to the supreme court until they are in their 50s, this is actually the relevant data. In the top panel, each diagonal line indicates the term of a single Supreme Court Justice, running from the date and age of appointment to age date and age of death or retirement. The black lines are justices who died in office, red lines are justices who resigned or retired, and blue lines are the eight justices currently serving. In the bottom panel, each dot represents a single justice. “Mid-Term Year” is the halfway point of their tenure (middle of the line in the top graph), and duration is how long they served (length of the line in the top graph. The line is a ten-point moving average. Current justices are not included. Notice that justices were not often dying by age 50, even in the early days. There are a couple of interesting trends, though. First, there’s a transition as we get into the 20th century, when it becomes much more common for justices to retire, rather than die in office. So, while the upper limit on the age we might expect a justice to live to might have increased by about ten years, the upper limit on the age at which they leave the court has not changed substantially in 200 years. 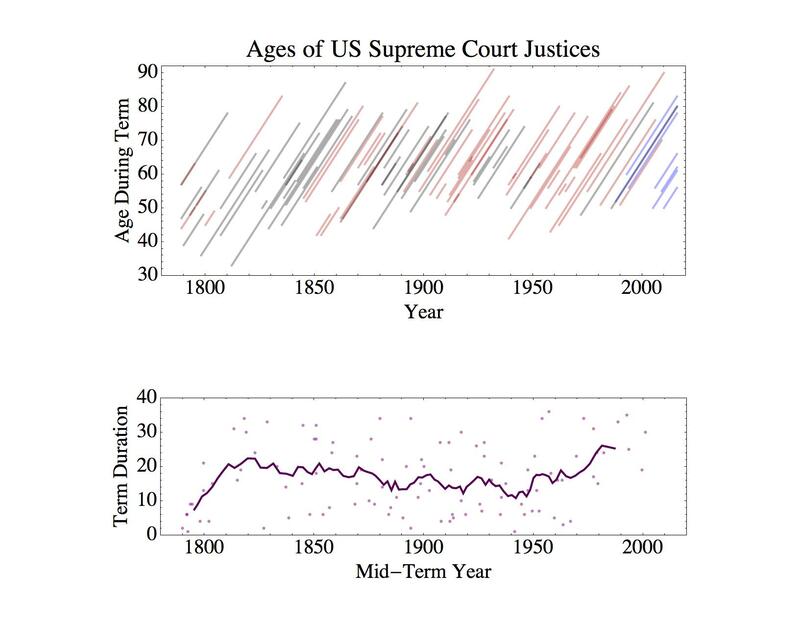 Second, after an initial shake-out (during which many of the justices did not have any sort of legal credentials), the long-term trend from 1820 to 1950 is towards shorter average term lengths (declining from around 20 to around 15 years). Starting with the second half of the 20th century, the trend has been towards longer tenures, with a recent average closer to 25 years. However, if you look at the scatter plot, you can see that this increase is mostly due to the absence of any short-term justices since 1970. So, it is true that we should probably expect that the next person appointed to the Supreme Court will be there for the next twenty to thirty years, but terms of that length have been around since the beginning. Well, we can answer that. Not stupid at all. In fact, Iowa is one of the smartest states in America. This is necessarily hard to figure out, of course, given that “stupid” is inherently contextual and subjective. In order to figure out how smart each state was, we looked at objective measures we had at our disposal. The results? Iowa is the eighth-smartest state, behind, in order: Massachusetts, Minnesota, New Hampshire, Connecticut, Wisconsin, Kansas and Vermont. Donald Trump’s home state of New York came in 17th. The bottom five states were Florida, Alabama, Mississippi, Nevada and, in the 50th spot, Hawaii. The Washington Post analysis combines four metrics: mean IQ score, mean SAT score, mean ACT score, and percentage of college grads. 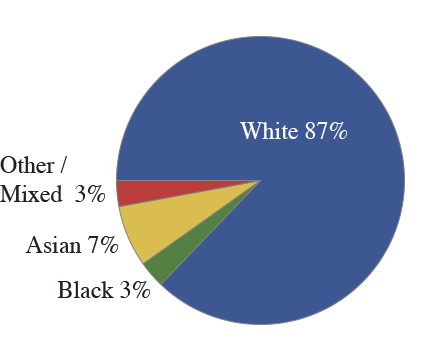 Each of these was converted to a percentage difference from the national median. They were then combined, with IQ being given twice the weight of the other three metrics. Now, there are a lot of caveats here, which the Post is aware of, and there are certain tweaks one might make. (For example, I might favor Z-scores over percentage difference from the median. Plus, there’s the conflation of intelligence and education, the confounding of those concepts with social and economic opportunity, etc., etc.) But, most of those probably don’t qualitatively change the conclusions of the analysis, and I’m not going to worry about them here. However, there is something striking when you look at the metrics themselves. 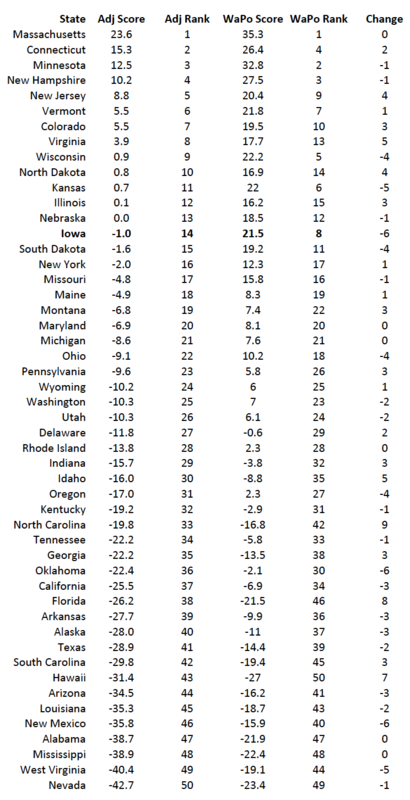 There seems to be a trend where states with positive SAT deviations (average SAT scores above the national median) have negative ACT deviations. For example, Alabama has an ACT deviation of -10.3, but an SAT deviation of +4.3. Maine’s deviations are +13.6 on the ACT and -10.4 on the SAT. Massachusetts has a +14.6 on the ACT, but a -0.1 on the SAT. 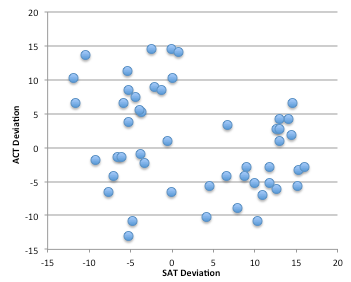 In fact, the correlation between ACT deviations and SAT deviations across all 50 states is r=-0.31. So what the heck is going on? Well, as it turns out, the variation in mean test score from state to state is determined almost entirely by test participation. The larger the percentage of kids who take a test, the lower the average test score. That’s presumably because, if 10% of the students in your state take the SAT, it’s not a random 10%. It is the most highly motivated students who are trying to beef up their college applications. The correlations are r = –0.90 for the SAT and r = –0.81 for the ACT. That means that the vast majority of the variation in test scores from state to state is accounted for by differences in participation. So, one simple thing to do is to fit a line through each of these distributions. Then, we can use that line to estimate what the mean test score would have been for each state if 100% of the students had taken the test. First off, after we make this correction, it turns out that the mean ACT and SAT scores in a state are positively correlated (r=0.73). So that makes it seem more plausible that we are looking at two different measures of the same underlying trait (“intelligence” combined with various cultural and economic factors). The “Change” column indicates how many positions up or down a state moves in the rankings after making this adjustment for test participation. Iowa moves down six spots from #8 to #14, but is still above the average, and still above New York. Other big losers are Oklahoma and New Mexico, both of which also move down six spots. The biggest winners are North Carolina (+9), Florida (+8), and Hawaii (+7). So why the shifts? In general, there are SAT states and ACT states. 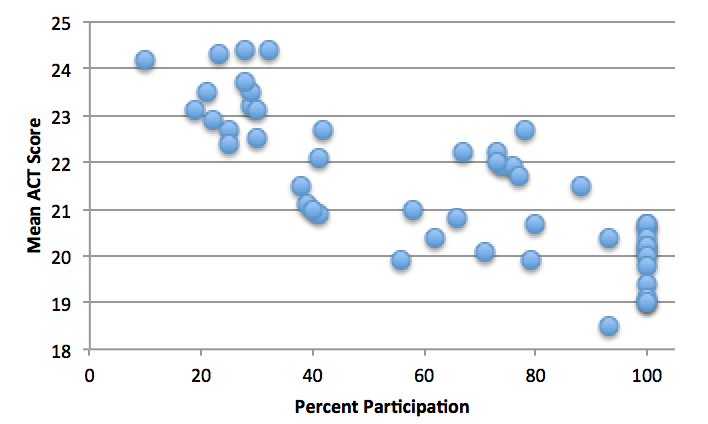 That is, in most states have very high participation in one of the tests and very low participation in the other. North Dakota is an ACT state, with 100% participation in the ACT, but less than 10% in the SAT. Maine is an SAT state, with >90% SAT participation, but only 10% ACT participation. In states like these, the two corrections tend to balance each other out. The states that move down most dramatically when we make the correction are those that have low participation in one test, but only modest participation in the other. 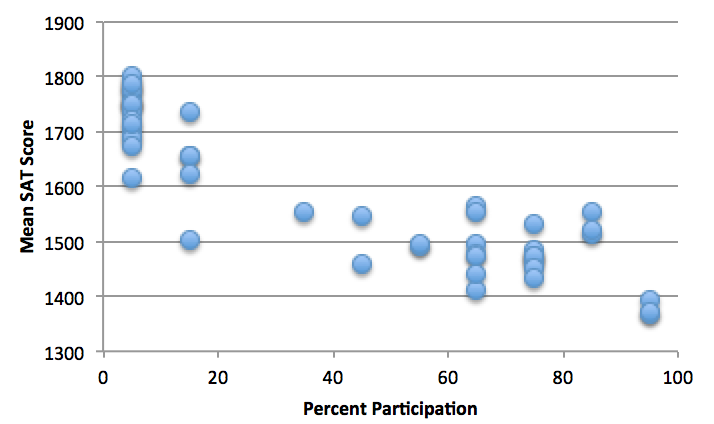 For example, Iowa has <10% SAT participation, but only 67% ACT participation. So, 25-35% of the students in Iowa took neither test. What this analysis suggests is that if they had taken one of the tests, they probably would have brought Iowa’s average scores down. Conversely, the states that move up are those where a significant fraction of students take both tests. In North Carolina, which jumped from 42nd to 33rd, 100% of students took the ACT, and 60-70% of them also took the SAT. But note that none of this undermines the central take-home message of the Post’s analysis: Donald Trump is a goddamn moron.